New York Review Comics, 9781681372969, 136pp. A touching graphic memoir about brotherhood, coming of age, and artistic inspiration by one of France's most celebrated graphic novelists. Edmond Baudoin is one of the most revered and influential figures in European comics, renowned for his slashing, expressive brushwork and narrative experimentation. 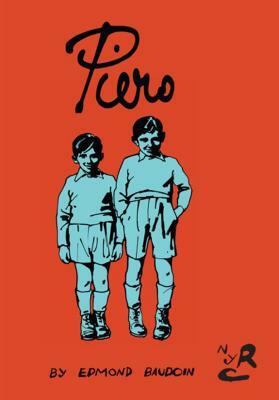 New York Review Comics is proud to present the first English translation of his most intimate and inviting book, his graphic memoir of growing up with his beloved brother, Piero. Whether stuck in bed with whooping cough or out exploring in the woods, the two brothers draw together endlessly. They confront Martians, battle octopuses, stage epic battles between medieval castles, and fly high over the earth. Inevitably, they begin to grow apart, and their shared artistic life is replaced by schoolwork, romance, dances, motorcycles, and the struggle to decide what sort of people they want to be. Piero is a delicate, exuberant testament to the joys of childhood and a bittersweet account of what it means to become an adult—and an artist. Edmond Baudoin was born in Nice in 1942. As a young man he was an accountant and he didn’t start drawing comics professionally until his late thirties. After having some short work published in magazines he had his first book published in 1981. He has gone on to be a prolific author and a guiding light of contemporary comics, having won prizes at the Angoulême Comics Festival for his books Couma acò (best album, 1992) and Le Voyage (best script, 1997). In addition to his output of autobiographical albums he has also branched out into children’s books, illustrated editions of classic works of world fiction, and live drawing performances in collaboration with dancers and musicians. Most recently he published a science fiction graphic novel co-written with the celebrated French mathematician Cedric Villani. When he is not traveling for book fairs and residencies, Baudoin divides his time between Paris and Villars-sur-Vars, the town outside Nice where he grew up. Matt Madden is a translator and cartoonist. He is the author of 99 Ways to Tell a Story: Exercises in Style, which is a comics adaptation of Raymond Queneau’s Exercises in Style, and of two textbooks co-written with his wife, Jessica Abel, Drawing Words & Writing Pictures and Mastering Comics. Madden and Abel were series editors of The Best American Comics for six years. He lives in Philadelphia.